2019 Knitting Classes Underway! Sign up today! Sizes available - Medium - You can make them full arm length or eliminate repeats of the lace and cable patterns to make them shorter. The yarn is somewhat stretchy so can accommodate various sizes. Pattern makes gloves that fit 7.5” arm around down to 6” at wrist back to 7” at thumb and closing at 6.5”. Welcome to Astraknots.com, a website dedicated to providing high-quality knitting instruction to all levels of crafters. Learning to knit is an enjoyable activity with productive results. Whether you are doing it to fill time waiting in lines, making hand-made gifts, learning a new skill or just to connect with other people who love to knit, Astraknots is here to support you. Our clear and concise videos and online classes are easy to follow and structured for your success because they were created by knitters. Astraknots.com also offers some well-written patterns and tips and tricks to help you navigate your knitting projects with ease. We know you'll enjoy it because knitting has been proven to be a relaxing activity and people love giving and receiving hand-made gifts. At Astraknots.com we are dedicated to providing high-quality knitting instruction in a highly consumable format so you can reap all the benefits of knitting. No matter your skill level, Astraknots offers you access to expand your knitting skills and community. 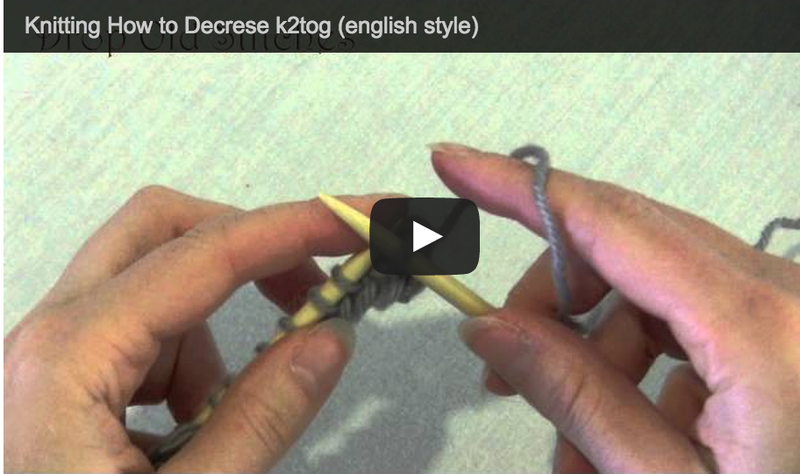 How to decrease by knitting two together (k2tog) english style.